"Roleplayer" redirects here. For the RPG magazine, see Roleplayer (magazine). Not to be confused with other forms of role-playing. A role-playing game (sometimes spelled roleplaying game; abbreviated RPG) is a game in which players assume the roles of characters in a fictional setting. Players take responsibility for acting out these roles within a narrative, either through literal acting, or through a process of structured decision-making regarding character development. Actions taken within many games succeed or fail according to a formal system of rules and guidelines. There are several forms of role-playing games. 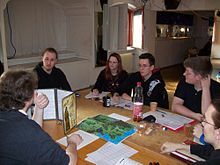 The original form, sometimes called the tabletop role-playing game (TRPG), is conducted through discussion, whereas in live action role-playing (LARP), players physically perform their characters' actions. In both of these forms, an arranger called a game master (GM) usually decides on the rules and setting to be used, while acting as the referee; each of the other players takes on the role of a single character. Several varieties of RPG also exist in electronic media, such as multiplayer text-based Multi-User Dungeons (MUDs) and their graphics-based successors, massively multiplayer online role-playing games (MMORPGs). Role-playing games also include single-player role-playing video games in which players control a character, or team of characters, who undertake(s) quests, and may include player capabilities that advance using statistical mechanics. These electronic games sometimes share settings and rules with tabletop RPGs, but emphasize character advancement more than collaborative storytelling. This type of game is well-established, so some RPG-related game forms, such as trading/collectible card games (CCGs) and wargames, may not be included under the definition. Some amount of role-playing activity may be present in such games, but it is not the primary focus. The term role-playing game is also sometimes used to describe games involving roleplay simulation and exercises used in teaching, training, and academic research. Both authors and major publishers of tabletop role-playing games consider them to be a form of interactive and collaborative storytelling. Events, characters, and narrative structure give a sense of a narrative experience, and the game need not have a strongly-defined storyline. Interactivity is the crucial difference between role-playing games and traditional fiction. Whereas a viewer of a television show is a passive observer, a player in a role-playing game makes choices that affect the story. Such role-playing games extend an older tradition of storytelling games where a small party of friends collaborate to create a story. While simple forms of role-playing exist in traditional children's games of make believe, role-playing games add a level of sophistication and persistence to this basic idea with additions such as game facilitators and rules of interaction. Participants in a role-playing game will generate specific characters and an ongoing plot. A consistent system of rules and a more or less realistic campaign setting in games aids suspension of disbelief. The level of realism in games ranges from just enough internal consistency to set up a believable story or credible challenge up to full-blown simulations of real-world processes. Role-playing games are played in a wide variety of formats ranging from discussing character interaction in tabletop form to physically acting out characters in LARP to playing characters virtually in digital media. There is also a great variety of systems of rules and game settings. Games that emphasize plot and character interaction over game mechanics and combat sometimes prefer the name storytelling game. These types of games tend to minimize or altogether eliminate the use of dice or other randomizing elements. Some games are played with characters created before the game by the GM, rather than those created by the players. This type of game is typically played at gaming conventions, or in standalone games that do not form part of a campaign. Tabletop and pen-and-paper (PnP) RPGs are conducted through discussion in a small social gathering. The GM describes the game world and its inhabitants. The other players describe the intended actions of their characters, and the GM describes the outcomes. Some outcomes are determined by the game system, and some are chosen by the GM. This is the format in which role-playing games were first popularized. The first commercially available RPG, Dungeons & Dragons (D&D), was inspired by fantasy literature and the wargaming hobby and was published in 1974. The popularity of D&D led to the birth of the tabletop role-playing game industry, which publishes games with many different themes, rules, and styles of play. The popularity of tabletop games has decreased since the modern releases of online MMO RPGs. This format is often referred to simply as a role-playing game. To distinguish this form of RPG from other formats, the retronyms tabletop role-playing game or pen and paper role-playing game are sometimes used, though neither a table nor pen and paper are strictly necessary. A LARP is played more like improvisational theatre. Participants act out their characters' actions instead of describing them, and the real environment is used to represent the imaginary setting of the game world. Players are often costumed as their characters and use appropriate props, and the venue may be decorated to resemble the fictional setting. Some live action role-playing games use rock-paper-scissors or comparison of attributes to resolve conflicts symbolically, while other LARPs use physical combat with simulated arms such as airsoft guns or foam weapons. LARPs vary in size from a handful of players to several thousand, and in duration from a couple of hours to several days. Because the number of players in a LARP is usually larger than in a tabletop role-playing game, and the players may be interacting in separate physical spaces, there is typically less of an emphasis on tightly maintaining a narrative or directly entertaining the players, and game sessions are often managed in a more distributed manner. An adventurer finds a teleportation portal while exploring a dungeon in the role-playing video game Falcon's Eye. Tabletop role-playing games have been translated into a variety of electronic formats. As early as 1974, the same year as the release of Dungeons & Dragons, unlicensed versions of it were developed on mainframe university systems under titles such as dnd and Dungeon. These early computer RPGs influenced all of electronic gaming, as well as spawning the role-playing video game genre. Some authors divide digital role-playing games into two intertwined groups: single player games using RPG-style mechanics, and multiplayer games incorporating social interaction. Single player role-playing video games form a loosely defined genre of computer and console games with origins in role-playing games such as Dungeons & Dragons, on which they base much of their terminology, settings, and game mechanics. This translation changes the experience of the game, providing a visual representation of the world but emphasizing statistical character development over collaborative, interactive storytelling. Typical MUD interface for God Wars II. Online text-based role-playing games involve many players using some type of text-based interface and an Internet connection to play an RPG. Games played in a real-time way include MUDs, MUSHes, and other varieties of MU*. Games played in a turn-based fashion include play-by-mail games and play-by-post games. Massively multiplayer online role-playing games (MMORPGs) combine the large-scale social interaction and persistent world of MUDs with graphic interfaces. Most MMORPGs do not actively promote in-character role-playing, however players can use the games' communication functions to role-play so long as other players cooperate. The majority of players in MMORPGs do not engage in role-play in this sense. Computer-assisted gaming can be used to add elements of computer gaming to in-person tabletop role-playing, where computers are used for record-keeping and sometimes to resolve combat, while the participants generally make decisions concerning character interaction. One common feature of many RPGs is the role of gamemaster, a participant who has special duties to present the fictional setting, arbitrate the results of character actions, and maintain the narrative flow. In tabletop and live action RPGs the GM performs these duties in person. In video RPGs many of the functions of a GM are fulfilled by the game engine. However some multi-player video RPGs also allow for a participant to take on a GM role through a visual interface called a GM toolkit, albeit with abilities limited by the available technology. Another standard concept in RPGs is the player character, a character in the fictional world of the game whose actions the player controls. Typically each player controls a separate player character, sometimes more, each of whom acts as a protagonist in the story. In contrast to player characters, non-player characters (NPCs) are controlled by the gamemaster or game engine, or by people assisting the gamemaster. Non-player characters fill out the population of the fictional setting and can act as antagonists, bystanders or allies of the player characters. ^ Harrigan, Pat; Wardrip-Fruin, Noah (2007). Second Person: Roleplaying and Story in Playable Media. MIT University Press. ISBN 9780262514187. ^ a b GURPS (4th Edition). Steve Jackson Games. 2004. pp. Chapter 1. But roleplaying is not purely educational. It's also one of the most creative possible entertainments. Most entertainment is passive: the audience just sits and watches, without taking part in the creative process. In roleplaying, the "audience" joins in the creation, may introduce huge impact to the project. The GM is the chief storyteller, but the players are responsible for portraying their characters. If they want something to happen in the story, they make it happen, because they're in the story. ^ Cover, Jennifer Grouling (2010). The Creation of Narrative in Tabletop Role-Playing Games. McFarland & Company. p. 6. ISBN 978-0-7864-4451-9. As suggested by the name, TRPGs are played face-to-face (around a table, most likely), and involve players 'acting out' a role. This acting is not always literal. Players do not arrive in costume or speak exclusively in-character — something that differentiates TRPGs from live-action role-playing games (LARPs). Instead, players develop characters based on certain rules and are responsible for deciding what those characters do over the course of the game. ^ (Tychsen 2006:76) "The variety of role playing games makes it inherently challenging to provide a common definition. However, all forms of role playing games – be they PnP RPGs, CRPGs, MMORPGs or LARPS - share a group of characteristics, which makes them identifiable from other types of games: storytelling with rules, control of fictional characters, a fictitious reality, usually the presence of a game master (or game engine), and at least one player." ^ a b (Tychsen et al. 2006:255) "LARPs can be viewed as forming a distinct category of RPG because of two unique features: (a) The players physically embody their characters, and (b) the game takes place in a physical frame. Embodiment means that the physical actions of the player are regarded as those of the character. Whereas in a RPG played by a group sitting around a table, players describe the actions of their characters (e.g., “I run to stand beside my friend")"
^ a b Kim, John. ""Narrative" or "Tabletop" RPGs". Archived from the original on 2008-08-29. Retrieved 2008-09-09. ^ a b (Tychsen 2006:75) "PnP RPGs are an example of interactive narratives. The rules and fictional worlds that form the basis for these games function as a vessel for collaborative, interactive storytelling. This is possibly the most important feature of PnP RPGs, and one that CRPGs have yet to reproduce." ^ a b Crawford, Chris (2003). Chris Crawford on Game Design. New Riders Publishing. p. 163. ISBN 978-0-13-146099-7. In some ways, the emphasis on character development has impeded progress in storytelling with RPGs. The central premise of these [computer RPGs] is that the player steadily builds his abilities by acquiring wealth, tools, weapons, and experience. This emphasis on character development tends to work against the needs of dramatic development - dramatic twists and turns clash with the prevailing tone of steady development. Fortunately, this impediment is not fundamental to the RPG genre; it is a cultural expectation rather than an architectural necessity. ^ (Heliö 2004) "In the family of role-playing games there are also a whole bunch of other game types and game-like activities that can be included or excluded, like the collectible card games (such as Magic: The Gathering) and board and strategy games (like Warhammer 40.000), or different forms of theatrical and larp-like combinations, such as fate-play. The action of role-playing is usually somehow present in these game forms, but the focus can be more either in the competitive nature of the game (MtG, Warhammer), or in the immersive performance (as in fate-play), than in role-playing itself." ^ Werewolf: The Apocalypse (2nd Edition). White Wolf Publishing. 1994. pp. Chapter 1. ISBN 978-1-56504-112-7. Although Werewolf is a game, it is more concerned with storytelling than it is with winning. Werewolf is a tool enabling you to become involved in tales of passion and glory, and to help tell those stories yourself. ^ Dungeons & Dragons Player's Handbook (4th Edition). Wizards of the Coast. June 6, 2008. pp. Chapter 1. ISBN 978-0-7869-4867-3. A roleplaying game is a storytelling game that has elements of the games of make-believe that many of us played as children. ^ (Heliö 2004) "Still, we must note that there is no actual story in the game of the role-playing game, though there are events, characters and structures of narrativity giving the players the basis for interpreting it as a narrative. We have many partially open structures that we may fulfil with our imagination during the course of the game – within its limitations. We also have the ability to follow different kinds of narrative premises and structures as well as imitate them for ourselves to create more authentic and suitable narrative experiences. We have the ‘narrative desire’ to make pieces we interpret to relate to each other fit in, to construct the plot from recurring and parallel elements." ^ Waskul, Dennis; Lust, Matt (2004). "Role-Playing and Playing Roles: The Person, Player, and Persona in Fantasy Role-Playing" (PDF). Caliber. 27 (3): 333–356. doi:10.1525/si.2004.27.3.333. Archived from the original (PDF) on 2012-12-04. Retrieved 2008-12-23. ^ Tychsen, Anders; Newman, Ken; Brolund, Thea; Hitchens, Michael (2007). "Cross-format analysis of the gaming experience in multi-player role-playing games" (PDF). Proceedings of DiGRA 2007 Conference: Situated Play. Digital Games Research Association (DiGRA). Retrieved 2010-01-01. The Role-Playing Game (RPG) is one of the major genres of games, and has proven an extremely portable concept - from the physically embodied live action and tabletop formats to the various digital, mobile and even enhanced and augmented reality formats. ^ (Tychsen 2006:77) "In PnP RPGs, the general game process consists of information-feedback cycles between the players and the GM, or internally within the group." ^ (Tychsen 2006:78–79) "The GM assumes a variety of responsibilities in PnP RPGs, depending on the playing style used, however, these normally include facilitation of game flow and game story, providing environmental content of the fictional reality, as well as administrating rules and arbitrating conflicts. ... In RPGs, the rules specify a great deal more than how pieces are moved on a game board. Because these games are focused on player characters, the rules are designed to govern the nature of these story protagonists and the fictional reality they act in. ... Note that the rules systems in PnP RPGs can be modified or ignored on the fly by the GM or players if so desired." ^ (Copier 2005:3) "...fantasy role-playing as a commercial product was developed in the 1970s as Dungeons and Dragons (D&D, 1974) by Gary Gygax and Dave Arneson. The game was based on a combination of their interests in table-top wargaming and literary fantasy." ^ a b c d " Barton, Matt (2008). Dungeons and Desktops: The History of Computer Role-playing Games. CRC Press. ISBN 978-1-43986-524-8. ^ Kilgallon, John; Sandy Antunes; Mike Young (2001). Rules to Live by: A Live Action Roleplaying Conflict Resolution System. Interactivities Ink. p. 1. ISBN 978-0-9708356-0-4. A live action roleplaying game is a cross between a traditional 'tabletop' roleplaying game and improvisational theatre. ^ Falk, Jennica; Davenport, Glorianna (2004). "Live Role-Playing Games: Implications for Pervasive Gaming". Entertainment Computing – ICEC 2004. Lecture Notes in Computer Science. 3166. Springer Berlin / Heidelberg. p. 131. ISBN 978-3-540-22947-6. Archived from the original (PDF) on 2013-02-02. Retrieved 2008-10-28. The LRP player, like a stage actor, is a person who under-goes a transformation into a character. The character’s costume and accessories, or kit, aids this transformation ... Physical structures may be used as game locations, and sometimes even purposely constructed to enhance the game world ... Players frequently use physical artifacts as props and tools in their role-play, primarily to back up their character roles. ^ (Heliö 2004) "Naturally, an off-game object does not actually transform into the object it is imagined as being in-game: for instance, if an airplane in the sky becomes a dragon in some larpers’ imaginations, it does not actually turn into a dragon – and even the players do not actually think so. The group of players have a common contract stating how to behave in the situation, because they willingly share the game’s make-believe world. In order to sustain the agreed immersion, the ‘dragon’s’ airplaneness’ should not in any case be directly voiced aloud." ^ (Tychsen et al. 2005:218) "[The LARP GM is] forced to let go of the game and let it take on a life of its own outside his or her control. While based on similar principles, the requirements [are] therefore very different in practice from GMs in PnP RPGs... The GM is generally, unless the LARP is small in terms of number of participants, not responsible for keeping the narrative flow. The GM can however oversee the progress of the game and help or influence where needed... Establishing a hierarchy of GMs and NPCs to monitor the game and ensure everyone is entertained and activated within the shared game space is a typical way of controlling large fantasy LARPS. This structure is usually established before the game commences." ^ (Tychsen 2006:75) "A major source of inspiration of computer games of all genres is role playing games. Being of a somewhat similar age as computer games, Pen and Paper Role Playing Games (PnP RPGs), a specialized form of table-top games (TTGs) involving multiple participants interacting in a fictional world, have influenced not only the Computer Role Playing Game (CRPG) genre , but virtually all types of computer games..."
^ Yee, N. (2006). The Demographics, Motivations and Derived Experiences of Users of Massively-Multiuser Online Graphical Environments. PRESENCE: Teleoperators and Virtual Environments, 15, 309-329. ^ (Tychsen 2005:218) "CRPGs can be separated into single- and multiplayer categories..."
^ (Heliö 2004) "Even if a game does not support active role-playing, as most of the massive multi-player online role-playing games fail to do (Dark Age of Camelot and others), experienced role-players may adopt the mindset and take advantage of the game’s communication functionalities, and start to role-play. This, however, requires the willing support or at least acceptance of the other players – any one of us can act like a prince, but if the others won’t play along, it does not constitute role-playing." ^ Eladhari, Mirjam P; Mateas, Michael (2009). "Rules for role play in Virtual Game Worlds Case study: The Pataphysic Institute": 1. Retrieved 2009-12-12. However, the majority of players in MMORPGs do not role-play at all, but self-play, that is, play as being themselves without adopting a fictional role. ^ (Tychsen et al. 2005:215-216) "The areas for which a GM can be responsible, regardless of the game platform (PnP RPG, LARP, CRPG or MMOG), vary not only internally in games from each platform but also across platforms. A GM in a MMOG generally has different responsibilities than a GM in a PnP RPG.These differences can be related to a limited number of variables, such as the media of expression. In some tabletop role playing games, including Dungeons and Dragons, the GM is referred to as the Dungeon Master, or DM. The full range of possible responsibilities of GMs can be subdivided into the following five categories, which also cover the functions of automated storytelling engines: [Narrative flow, Rules, Engagement, Environment, Virtual world:]"
^ (Tychsen et al. 2006:255) "In a computer RPG, the role of the GM is taken on (with varying degrees of success) by software." ^ (Tychsen et al. 2005:218) "CRPGs can be separated into ... those few who have incorporated a GM toolkit instead of a fully automated storytelling engine. ... In PnP RPGs and LARPs all lines of normal human communication are available: Speech, Emotion and Body Language (Figure 3). In CRPGs and MMOGs, they become narrowed down due to technical limitations, albeit with the added feature of Scripting as a means of communications. Additionally, contemporary game engines do not allow for on-the-fly updating of the game world and generation of new content in reaction to the actions of the player-controlled avatars (or characters in PnP RPG terminology)." Copier, Marinka (2005). "Connecting Worlds. Fantasy Role-Playing Games, Ritual Acts and the Magic Circle" (PDF). Proceedings of DiGRA 2005 Conference: Changing Views--Worlds in Play. Digital Games Research Association (DiGRA). Retrieved 2009-04-26. Heliö, Satu (2004). "Role-Playing: A Narrative Experience and a Mindset" (PDF). Beyond role and play (PDF). Solmukohta. ISBN 978-952-91-6843-9. Archived from the original (PDF) on 2011-05-01. Retrieved 2009-01-09. Tychsen, Anders; Hitchens, Michael; Brolund, Thea; Kavakli, Manolya (2005). "The Game Master". The Second Australasian Conference on Interactive Entertainment. Creativity and Cognition Studios Press. p. 218. Retrieved 2008-12-03. Tychsen, Anders (2006). "Role Playing Games – Comparative Analysis Across Two Media Platforms". Proceedings of the 3rd Australasian conference on Interactive entertainment. Australia. pp. 75–82. This page was last edited on 1 April 2019, at 10:36 (UTC).